Blue Monday (#BlueMonday) is here and you will find a lot of stuff on the internet telling you how to get up this morning and get your foot out the door with a smile on your face. Beat the Monday blues by making coffee, waking up early, making a goals list, listening to your favourite music…..the list can go on. The thing is though, that all these are just solutions to an obvious problem – feeling blue. Dreading the routine after two days of relaxation is natural, but if the thought of your workplace makes you cringe and groan inducing nothing but bad feelings, then there’s a bigger problem at hand. And making coffee or a goals list aren’t going to help. 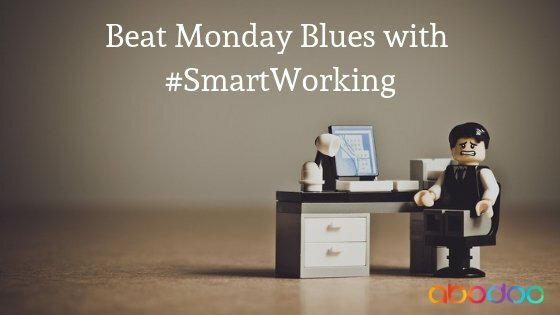 Getting the blues on Monday morning is your mind’s way of telling you that something isn’t right. All those solutions to tackle this feeling will help you kickstart your week and get moving, but they won’t help identify the actual problem. Here are some of the potential reasons why you hate going in to work on Monday mornings. Your job is too demanding, either time wise or work wise. You don’t have any job satisfaction and the work isn’t meaningful anymore. There is no balance between your work life and personal life, allowing you lesser quality time with your loved ones. The work just doesn’t make you happy anymore. There is no time for anything else, or you can’t remember why you started out in this profession in the first place. Having a job that is too demanding in any aspect leaves plenty of time for resentment and little time for for anything else. However, there is a solution that will help you not only keep your job but actually enjoy it whilst giving you quality time to live your life. And that’s smart working! Having a flexible working schedule allows you plenty of time to better manage your life. You can spend time with loved ones, focus on yourself, and work at your most productive times. You will therefore be more engaged with work and can attain work-life harmony. So say goodbye to Blue Monday and embrace the new way of working by registering on Abodoo and getting matched to a job with flexibility.